Hospitals in Puerto Rico are dealing with no power, no air conditioning, no local water, no local food, no Internet and very limited communication. The hospital in Arecibo, Puerto Rico, evacuated its coronary floor this week and moved those patients into cooled tents erected by an American disaster medical team. The U.S. Disaster Medical Assistance Team (DMAT) inspects a damaged hospital in Aguadillo, Puerto Rico, with a federal agent providing force protection. U.S. 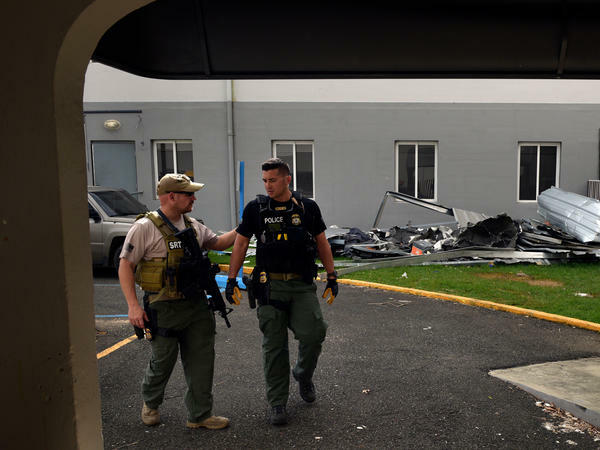 Disaster Medical Assistance Teams erected two cooled emergency rooms for critically ill patients at the hospital in Arecibo, Puerto Rico, where temperatures on the 6th floor soared to 112 degrees one day. Sarilin Lopez, grateful to be in the field hospital, says, "It was so hot I could hardly breathe." 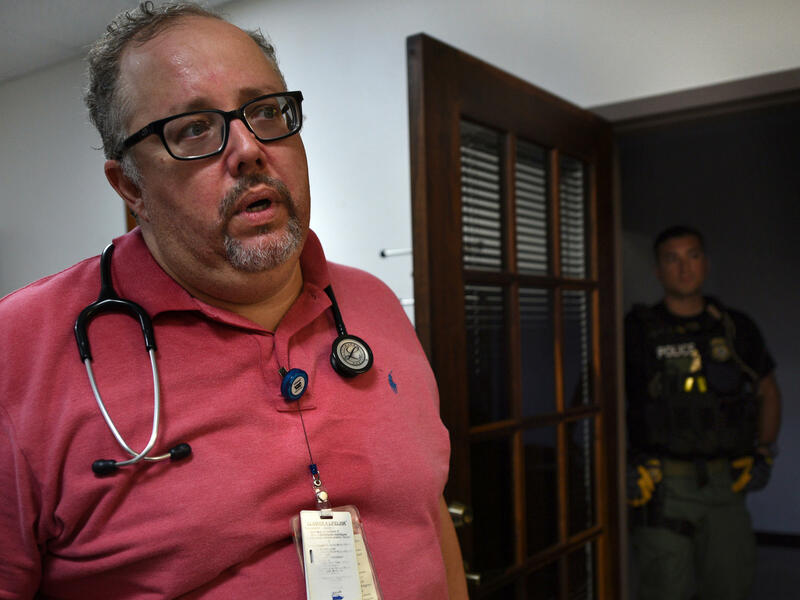 Dr. Arturo Cedeno, medical director of Good Samaritan Hospital in Aguadilla, Puerto Rico, tells an American disaster medical team his hospital needs a new generator to run the air conditioning to keep it functioning. At the Pavia Arecibo Hospital, about an hour west of San Juan, administrator Jose Luis Rodriguez wipes sweat from his worried brow. "We don't have any air conditioning," he says. "We can handle maybe a week, but it's already been two weeks almost." The government calls them "indirect deaths" – those who died after the violent storm: heart attack victims, people on kidney dialysis machines that failed, people who fell off roofs inspecting storm damage, and people killed in auto accidents on highways made more treacherous from Maria's destruction. "So far after the storm we have had 49 dead bodies," says Rodriguez. Earlier this week, the governor of Puerto Rico raised the official fatality figure for Hurricane Maria from 16 people to 34. But with unofficial reports like the one from Arecibo, that number is expected to rise. The fourth floor of the Arecibo hospital has now been taken over by stocky mid-westerners in khaki pants, black boots and T-shirts emblazoned with DMAT, for Disaster Medical Assistance Team. It's a kind of National Guard for reservist medical workers that falls under the Department of Health and Human Services. Chief medical officer of this DMAT currently deployed to Arecibo is Dr. Melissa Stein. She's normally an urgent care physician at Mercy Hospital in St Louis. "In telling team members coming here we tell them it's going to be an extremely austere environment," she says. Each deployment has its challenges. In the Arecibo hospital, it was the sweltering sixth-floor cardiac unit. The temperatures up there were as high as 108 degrees and even higher. "This was a huge stress on the patients who were quite sick. So we have ended up moving them to these tents where the hospital staff is caring for them," says Dr. Jim Fehr, who is on the DMAT team. Lying in the cooling tent is a 77-year-old retired factory worker named Georgina Gonzales. Had she not been brought here she might have ended up as an indirect victim of the storm. "Very hot, very hot! I was suffocating," she says. "When they transferred me here on Sunday, they rescued me from the dragon's mouth." Team commander George Thorp springs into action. "We'll get a strike team there right away," he says. Within an hour, the strike team is racing down the highway, past utility poles snapped like pencils and the fallen arches of a McDonald's. "I'm chief medical officer for a national disaster medical assistance team," Dr. Stein tells the hospital director. "We had been told that you needed significant help. I can tell when we pulled up the story was somewhat exaggerated." The Aguadilla hospital administrator, Marilyn Morales, listens politely. 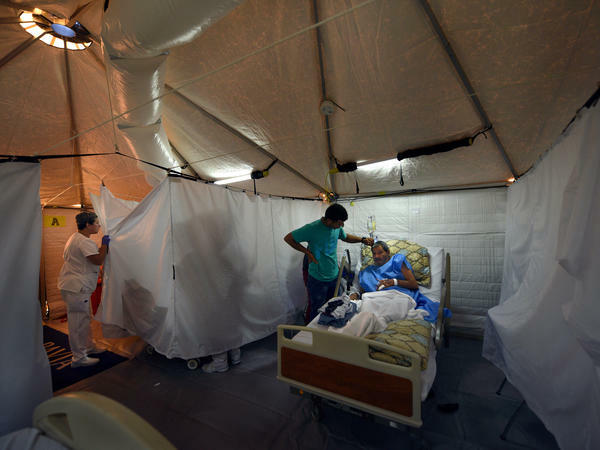 "Our emergency room is in bad condition in terms of the temperature," Morales says. "If you can install something next to the ER that would be excellent, with physicians, medications and supplies." 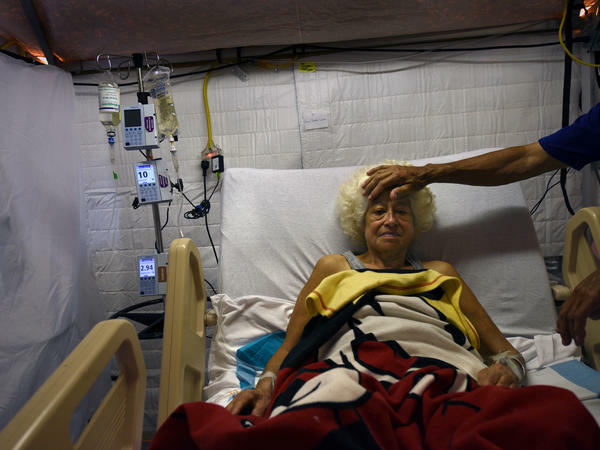 As it turns out, both the Arecibo and Aguadilla hospitals are in the same boat —there's no air-conditioning, the emergency generators need maintenance, and the patients and staff are hot. After a tour, Stein promises to request some federal help, and the team files back out onto the sidewalk. "All right, saddle back up, get your packs," she says, adding with a smile, "This is not the hospital of the walking dead which is what had been described." And let's turn now to Puerto Rico, where three-quarters of hospitals are still operating on limited emergency power. This creates dangerous conditions for critically ill patients. NPR's John Burnett spent a day with a federal disaster medical team. 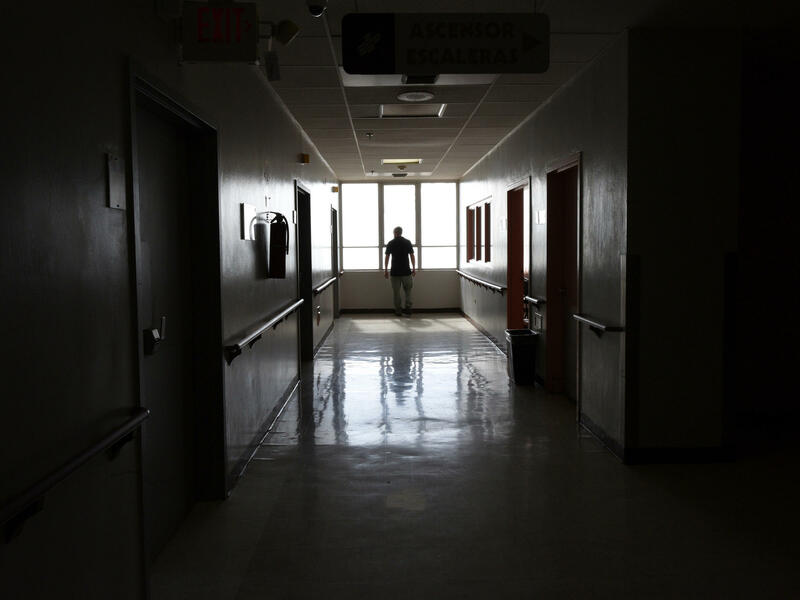 JOHN BURNETT, BYLINE: Every day across this Caribbean island with its shattered power grid, hospitals wage a life-and-death battle to keep their patients from getting sicker in the tropical heat. At the Pavia Arecibo Hospital, about an hour west of San Juan, administrator Jose Luis Rodriguez wipes sweat from his worried brow. JOSE LUIS RODRIGUEZ: We don't have air conditioning. We can handle maybe a week, but this is already two weeks almost. BURNETT: The government calls them indirect deaths, those who died after the violent storm - heart attack victims, people on kidney dialysis machines that failed, people who fell off damaged roofs and people killed in auto accidents on highways made more treacherous from Maria's destruction. The official death toll is 34, but because of reports like this from local hospital officials, the number is expected to rise. RODRIGUEZ: So far, after the storm, we have had 49 dead bodies. 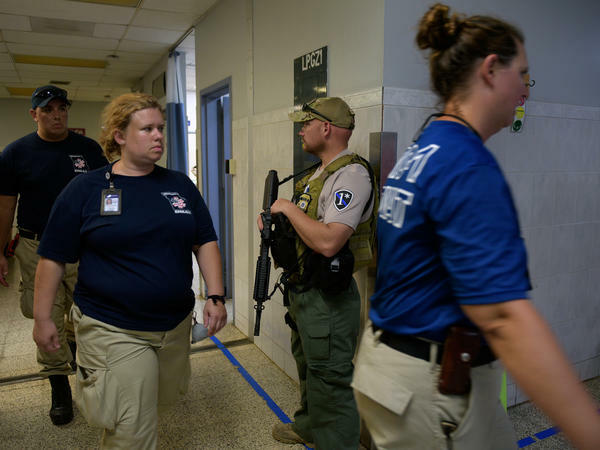 BURNETT: The fourth floor of the hospital has been taken over by stocky Midwesterners in khaki pants, black boots and T-shirts that say DMAT for Disaster Medical Assistance Team. It's a sort of National Guard for medical people that falls under the Department of Health and Human Services. Chief medical officer of this DMAT is Dr. Melissa Stein. She's normally an urgent care physician at Mercy Hospital in St. Louis, currently deployed to Arecibo. MELISSA STEIN: And so in telling team members coming here, we tell them it's going to be an extremely austere environment. BURNETT: There is no power, no air conditioning, no local water, no local food, no Internet and very limited communication. Each deployment has its challenges. Here in Arecibo, it was the sweltering sixth-floor cardiac unit. JIM FEHR: The temperatures up there were as high as 108 degrees, even higher. This was a huge stress on the patients who were quite sick. So we have ended up moving them here to these tents where the hospital staff is caring for them. BURNETT: That's Jim Fehr, one of the DMAT docs. Lying in the cooling tent is a 77-year-old retired factory worker named Georgina Gonzales. She may have ended up as an indirect victim of the storm had she not been brought here. GEORGINA GONZALES: (Through interpreter) It was hot, very hot. I was suffocating. When they transferred me here on Sunday, they rescued me from the dragon's mouth. BURNETT: Back on the fourth floor, a distraught woman appears with a shocking story. 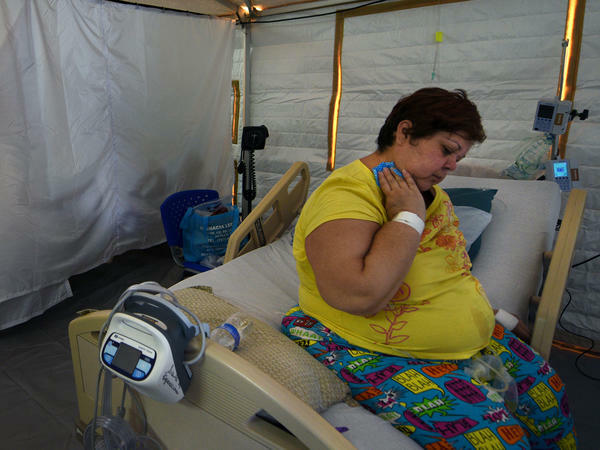 The hospital an hour away in the city of Aguadilla, she says, has shut down, kicked out its patients and it smells like decomposing bodies. Team commander George Thorp springs into action. GEORGE THORP: We'll get a strike team out there right away. BURNETT: Within an hour, the strike team is racing down the highway past utility poles snapped like pencils and the fallen arches of a McDonald's. The team roars up to the Good Samaritan Hospital of Aguadilla. Two heavily armed federal agents enter first. Then comes the DMAT, expecting the worst. They walk down a corridor past bewildered nurses and are ushered into a quiet, orderly office. Nervous laughter all around. Dr. Melissa Stein speaks first. STEIN: I am the chief medical officer for a national disaster medical assistance team, and we had been told that you needed significant help. I can tell by pulling up, at least the story we were given was somewhat exaggerated. BURNETT: The hospital administrator, Marilyn Morales, listens politely and responds. MARILYN MORALES: Our ER department, you know, is in bad condition in terms of the temperature. BURNETT: As it turns out, both hospitals are in the same boat. There's no air conditioning. The emergency generators need maintenance, and the patients and staff are hot. After a tour, Stein promises to request some federal help, and the team files back out onto the sidewalk. STEIN: All right. Saddle back up. Get your packs. STEIN: This is not the hospital of "The Walking Dead," which is what had been described to us. BURNETT: And that is a good example of what happens after a traumatic weather event when there is no communication, rumors fly and people worry about their hospitals. John Burnett, NPR News, Arecibo, Puerto Rico. (SOUNDBITE OF TOMAS GUBBINS' "REFUGIO") Transcript provided by NPR, Copyright NPR.